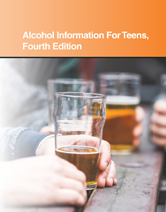 Alcohol Information for Teens, Fourth Edition provides updated information about the use and misuse of alcohol. It describes ways alcohol can affect mental and physical health. It discusses the special vulnerabilities of the teen brain and the changes in brain functioning that lead to dependency. Chapter 3— Can Some People Consume Alcohol Safely? Chapter 36— Sobriety: The First 30 Days. Chapter 41— A Family History Of Alcoholism: Are You At Risk?